Nine years ago, the USA officially banned the term, “War on Drugs. ” At the same time, the Department of Justice decided not to go after medical marijuana violators of federal law. 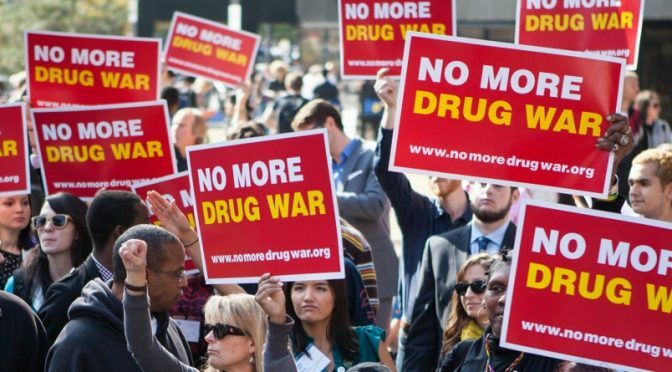 The Drug Policy Alliance (DPA) still blames drug deaths on a “war on drugs.” Using this euphemism and others, DPA pushes a disconnect between truth and public perception to rouse its followers. The organization recently introduced a podcast series which seems aimed at luring new drug users. Death in the “drug wars” occur because rival dealers and cartels compete for money, distribution and control. (The rivalry also means that marijuana from dispensaries is 10x stronger than it was in 1970s.) The DEA, our government and other governments do not cause the killings over drugs. “Drug Wars” happen because greed and the quest for power are encoded into the human DNA. Cartels and drug pushers still aggressively pursue their markets in the US, which leads to an increased demand for drugs. Drug Policy Alliance promotes “harm reduction.” Originally, Harm Reduction focused on clean needles and medication assisted treatments. DPA wants to make policy, but the organization refuses to acknowledge how harmful drugs really are. Drug Policy Alliance recently put out a paper on decriminalizing all drugs, a first step towards legalization. The Czech Republic’s decriminalization of drugs led to a big increase in drug use, and DPA never mentions it. If people knew more about the Czech Republic, they wouldn’t buy into DPA’s spin. Drug Policy Alliance uses “social justice” reasons to push for legalization of drugs, first through decriminalization. The cry for social justice tricks people into thinking they support racial equality by supporting marijuana legalization. In fact, just the opposite occurs under legalization. When drug use causes death, the Drug Policy Alliance thinks that dealers should not be charged with homicide. In most instances when someone hastens the death of another, the justice system considers it involuntary manslaughter. The Drug Policy Alliance believes that drug dealers deserve privileges that no one else has. The DPA wishes to discredit drug courts and mandated treatment as ineffective. 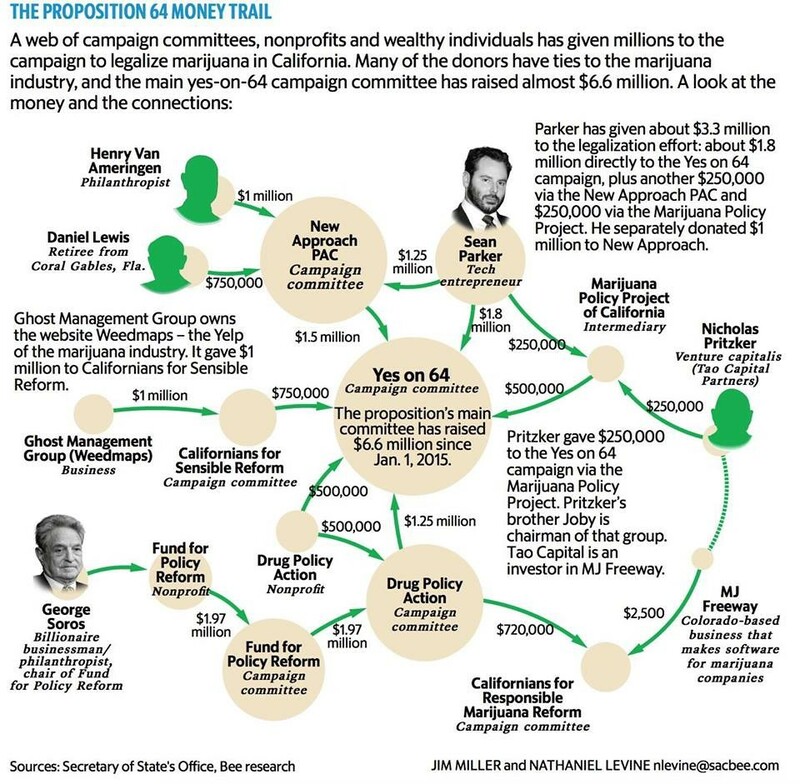 The DPA and other pot lobbying groups pretend that people go to jail for simple marijuana possession. In truth, the people who go to jail for marijuana only have plea bargained, reducing the sentencing for larger crimes. Social justice arguments lose its validity under legalization, because drug dealers, legal and illegal, target poor communities. 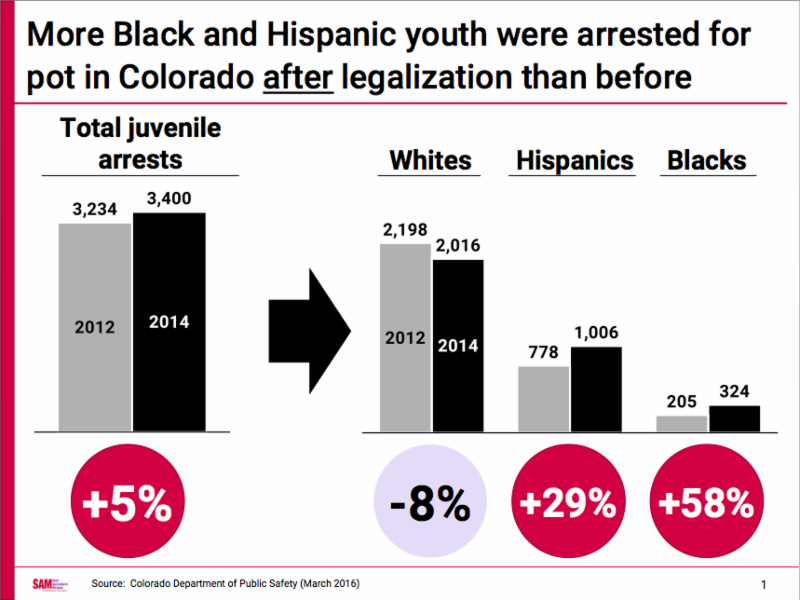 In fact arrests for Black and Hispanic youth went up in Colorado after the legalization of marijuana, by 58% and 29% respectively. During the same time period, arrests for white youth went down 8%. Even more importantly, marijuana is a performance-disabling drug. It can trigger permanent mental illness, although the DPA inaccurately discards the relationship between marijuana and psychosis. If people use pot during the critical teen years, marijuana can cause an 8-point drop in IQ over the course of 20 years. People like Sean Parker or Steve Jobs, people who start off with extremely high IQs, can afford to lose eight IQ points. Minorities and those from disadvantaged backgrounds have the most to lose in terms of future opportunity by using marijuana. Furthermore, any legalization misleads minority children into believing drugs are harmless. Discrepancies in the criminal justice system come from issues far more complicated than “the war on drugs.” The DPA suggests complex problems can be solved with simple solutions. Dig a little deeper and the DPA argues in favor of drug legalization for sinister reasons. Today, drug overdoses account for far more deaths than guns and traffic, nearly double each of those causes of death. The US government fails to stem the tide, because we only look at opioids and fail to address poly substance abuse. Everyone should know that selling or giving drugs to another person could result in death. DPA wants drug education to focus on harm reduction, not on the fact that drug use can lead to death. Harm reduction fails as drug deaths have risen sharply, particularly in ages 18-44. The rise in deaths crosses every demographic group. George Soros needs to admit his policy failed. Read our our first article about George Soros. At the heart of the DPA’s deception is putting drug users’ rights above the rest of us. The outcome is great disrespect the families who have lost loved ones to drugs and to stoned drivers.